This quick and easy vegetarian, one-pot meal can be ready in just 20 minutes. Cook the cauliflower in boiling water for 3-4 minutes, or until just tender, then drain, reserving 100ml of the cooking liquid. Meanwhile, heat the oil in a large pan and fry the aubergine for 4 minutes. 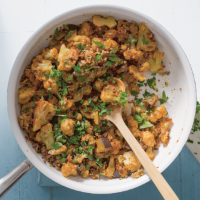 Add the almonds, tomato paste and cauliflower with the reserved cooking liquid and stir-fry for 1-2 minutes. Cook the mixed grain pouch according to pack instructions, stir into the cauliflower and season to taste. Scatter with chopped parsley, if using.